By now, you'll have probably noticed I am doing a series of photo album options and I'm really enjoying being able to review them all. This week's is a photobook by Photobooks, which is a sister company of Freeprints from last week. Unlike the other photo albums that I've made, this one I decided to use for my business and I love it. It was super easy and simple to make, I received it quickly and good change things very easily. As a new start up business, I didn't want to spend a fortune on books showcasing my products so I think these were the perfect option for me. Unfortunately, my first photobook did get lost in the post so I never received it but when I contacted customer services, they very quickly helped me out and I received the new one within a few days. My last order had no problems and came through very quickly. I think everyone loves photo books, but making them in the past has always tedious work. I used to do scrapbooking but was never happy with the result and even though I love the qaulity of my Saal Digital book, it was a pain in the arse to actually make. It was so time consuming, it was actually super stressful. Given that been cumbersome, time-consuming and costly. 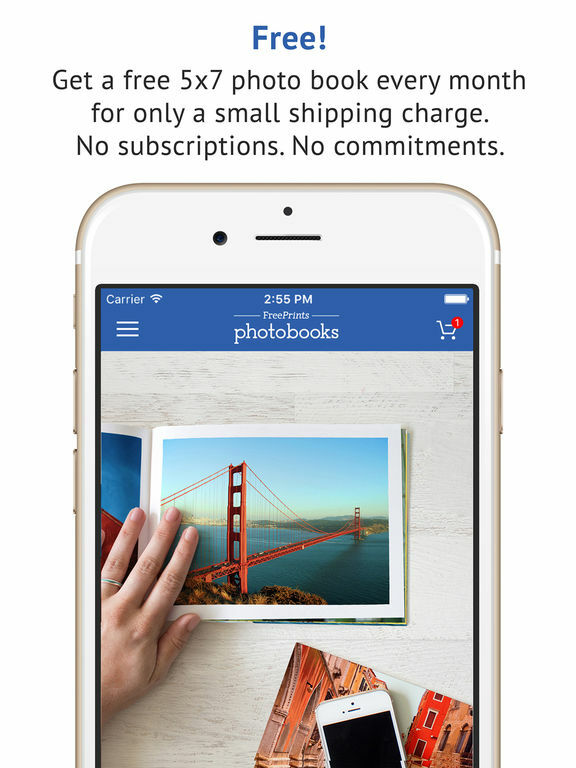 The FreePrints Photobooks app changes all that Photobooks is made directly from an app right on your phone makes this option super easy. Of course, the absolute best thing is that the actual Photobook is free. 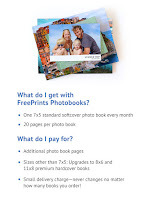 Each month you get one 7x5 20 page standard softcover photo book for free! My first photobook actually got a free upgrade to hardback as well which I love. Unlike a lot of customers, there isn't a subscription and it's completely up to you if you buy a photobook each month or not. Of course, they do have to make money some how, so you do have to pay a small delivery charge but it's only ever £5.99 or less so it's still an amazing deal. Like with most free products, you do have the option to upgrade your photobook but that does incur additional charges. There are premium hardcover books in 8x6 and 11x8 available. As I said previously, my first book had a free upgrade and because of that, I've just ended up upgrading all of mine. It's not all that expensive to be honest, so for me it was worth it. All of the interior pages are printed on acid-free, archival paper with a satin finish that makes photos sharp and vibrant. The softcovers are heavy stock with a high-quality gloss laminate finish wheres the durable hardcovers are scratch resistant and come in a high-quality gloss laminate finish. Also, for the free option, there is a limit of 20 pages which may not seem like a lot but because you can easily add multiple pictures to each page, they do last. Having said that, if you do want to add more pages, you can do very easily, again it is an additional cost but it's not too expensive. You can go up to a total of 150 pages in each book which I think it amazing! With my second order, I actually wanted two separate photobooks because I was holding a party and needed them both to arrive quickly. I loved that even though I then paid full price for my second book, I didn't pay an extra for delivery. It was still £5.99 and it remains that price no matter how many books or which size you order. From the website, they guarantee 100% satisfaction or your money back. I haven't needed to use that service but given the fact that they quickly sent me a second copy of my lost book, I see no reason why this wouldn't be easy to do as well. The books aren't the absolute best quality but I would defintely say that they are high quality. All the books are printed on premium papers with vivid colour and the covers are long-lasting laminate, which is perfect for memories you want to look back on or, like me, for product showcasing that you will use regularly. Like with Freeprints, if you subscribe to email updates, you do get monthly reminders that you have a free photobook this month. Again I like this feature because I can utilise it when I need to, but I don't have to. Of course, if you don't want to or find you are getting too many, you can very easily unsubscribe from them. The monthly allowance resets at midnight GMT on the 1st of each month. One of my favourite features, which I actually found really useful, was the blurry photo notification. When I originally uploaded my pictures, some of them had a little small triangle with an exclamation mark in the corner. I was a little confused at first but when I realised it was telling me about my photo quality, I quickly switched them out until there were none. The fact that it tells you about poor quality photos or whether it's too small and will appear fuzzy or blurry when printed is amazing! I'm sure you can already tell but overall, I loved this app. I love the quality of the product I received, at both the price and speed of delivery. I think that the app is incredibly easy to use and I love that the product is completely customisable. If you want to get your own free photobook, download the app today at iTunes or on the Google Store. I would love to see yourcreations so if you make one, be sure to tag me on Instagram or Twitter at @hannahelizabethblog and @hansla1000. How cute and easy are these!